These indicators make a nice gift or addition to your own car. This is for the indicators only. Luces Ahumado Indicadores Para Toyota MR2 II 2 12/1989 - 05/2000 Sr. They are keenly priced and make a fantastic buy, giving your MR2 a fresh modern look. Nuevo par de claro frontales indicadores para la Toyota MR2 II 12/1989 - 05/2000 como se muestra en la imagen. Here we have a pair of clear OE style/quality 'Toblerone' JDM side indicator lenses. Individually hand cast in the U.K since 2005, they are made from the highest quality polyurethane resin normally reserved for industrial prototyping. Seitenblinker Paar. 1 Set - für linke (Fahrer) und rechte (Beifahrer) Seite. Lexus RX GS Toyota Starlet Paseo Coupe MR 2 W2 RAV4 II. Toyota MR 2 II Typ W2. Lexus RX Typ MCU. Lexus RX Typ XU1. Toyota Starlet Typ EP91. Individually hand cast in the U.K since 2005, they are made from the highest quality polyurethane resin normally reserved for industrial prototyping. Supplied with a pair of amber bulbs, I have also produced an illustrated PDF showing the fitting procedure. Lexus-style and styling lighting; headlights; tail light, indicators, side repeaters & more. 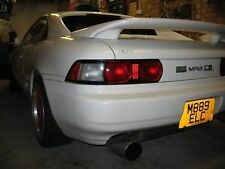 Clear Indicators to fit: TOYOTA MR2 Mk2 (1991 to 1999). Bulbholders are not usually supplied as most lights use the originals on the car. Estan usados, se acoplan perfectamente aunque uno de ellos tiene un pasador de plastico roto pero no se aprecia una vez montado y no supone ningun inconveniente, ni se mueve ni se nota ni causa ningun problema. El precio es por cada uno de ellos mas gastos de envio aunque lo puedes recoger in situ o buscar un porte economico o cualquier otro si hay alguna preferencia. Pair of clear front indicator lenses to fit MR2 Mk1 AW11. These are hand cast in the U.K from the highest quality polyurethane resin normally reserved for industrial prototyping and carry all the original factory markings. Toyota MK1 / MK2 Sleepy Eye / Lazy Eye Kit. Sleepy eye kits are a simple modification to enhance your cars look. Here we have a pair of clear rear indicator/turn sections to fit Rev 1/2 SW20 MR2's. Individually hand cast in the U.K since 2005, they are made from the highest quality polyurethane resin normally reserved for industrial prototyping. Individually hand cast in the U.K since 2005, they are made from the highest quality polyurethane resin normally reserved for industrial prototyping. I have also produced an illustrated PDF showing the fitting procedure. These are a great upgrade for the old style Japanese toblerone indicators, or the USA rub trim lights. 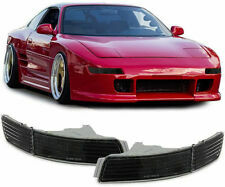 New Crystal Clear Style Import Side repeaters Toyota MR2 mk2 1989-2000. 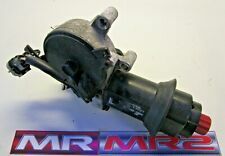 Suitable for: Toyota MR2 mk2 2.0L 2.2L 1989-2000. Here we have a pair of clear OE style/quality 'Toblerone' JDM side indicator lenses. These refit to the original backings, photo sequence available. Individually hand cast in the U.K since 2005, they are made from the highest quality polyurethane resin normally reserved for industrial prototyping. Crystal Black Indicators to fit: TOYOTA MR2 Mk2 (1991 to 1999). Lexus-style and styling lighting; headlights; tail light, indicators, side repeaters & more. Bulbholders are not usually supplied as most lights use the originals on the car. Lexus-style and styling lighting; headlights; tail light, indicators, side repeaters & more. 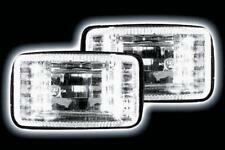 Crystal Clear Indicators to fit: TOYOTA MR2 Mk2 (1991 to 1999). Bulbholders are not usually supplied as most lights use the originals on the car. I have also produced an illustrated PDF showing the fitting procedure. Individually hand cast in the U.K since 2005, they are made from the highest quality polyurethane resin normally reserved for industrial prototyping. HERE WE HAVE A PAIR OF CLEAR FRONT AND REAR INDICATOR/TURN LENSES FOR THE AW11 MR2 Mk1a SUPPLIED WITH 2 PAIRS OF AMBER BULBS. (DIFFERENT BULBS NEEDED FOR FRONT FOR U.S SPEC CARS). THIS ALLOWS YOU TO ACHIEVE AN 'OE' STYLE CONVERSION WHICH EXACTLY LIKE A FACTORY FIT OPTION. Ash Tray, Cup Holder, Cigarette Lighter. TOYOTA GENUINE. SEITENBLINKER LEXUS / TOYOTA , . Ausführung: Klarglas links = rechts, beidseitig verwendbar, 1 Stück geeignetes Leuchtmittel: WY5W Eintragungsfrei mit E-Prüfzeichen Hinweise und Einschränkungen: für Lexus GS, Mod. Bj. 3/93-8/97 für Lexus RX, Mod. Bj. 8/97-4/09 für Toyota Carina E T19, Mod. Bj. 4/92-9/97. COPPIA LAMPADE RETROMARCIA 15 LED P21W CANBUS TOYOTA MR-2 MK2 6000K NO ERROR. - Tipo connettore: P21W / BA15S. - 2 lampade (destra e sinistra) P21W Ba15S 15 LED CANBUS CON LENTE FRONTALE. 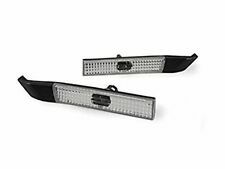 Crystal Black Side Repeaters to fit: TOYOTA MR2 Mk2 (1991 to 1999), Mk3 (1999 to 2007) (NOT E-APPROVED). Lexus-style and styling lighting; headlights; tail light, indicators, side repeaters & more. Suitable for both Right Hand Drive and Left Hand Drive. Removed from a mk3 Mr2 that we currently have for breaking. Toyota MR2 Mk1 & Mk2. This item will fit all Toyota Mr2 Mk1 and Mk2 models with the square headlights. These lights use Halogen H4 bulbs ( not included ) which you should have in your old lights ( unless you have sealed be units fitted ). GLOVE BOX IN GOOD CONDITION. TOYOTA GENUINE. ITEM photograph. INDIVIDUALLY HAND CAST IN THE U.K FROM THE HIGHEST GRADE POLYURETHANE RESIN NORMALLY RESERVED FOR INDUSTRIAL PROTOTYPING. Toyota MR2 MK2. Will fit all MR2 MK2's 1989-1999. The engines in the MR2's that we get are 3SFE, 3SGE & 3SGTE - We do not get the 5SFE Engine therefore i know nothing about it. Passenger Side Light Cover. MR 2 II (W2) 2.0 16V. Gebrauchsspuren sind deshalb kein Grund für eine Reklamation. Gebrauchte Gegenstände kosten in der Regel einen Bruchteil gegenüber neuen Gegenständen. Karoserieteile wie Kotflügel,Motorhaube,Türen,Heckklappen,Stoßstangen müssen eventuell nachlakiert werden. Toyota MR2 MK2. Item is from a 1993 Revision2 UK MR2 MK2. Item is for Revision1 & Revision2 Type MR2's only.if unsure pls ask. Drivers Side Rear Light Corner Reflector. The engines in the MR2's that we get are 3SFE, 3SGE & 3SGTE - We do not get the 5SFE Engine therefore i know nothing about it. Toyota MR2. (Pair of Bulbs). They are easily used to replace existing bulbs and require no modifications to fit. Product Specification. Toyota MR2 MK2. Will Fit all MR2 MK2's 1989-1999. The engines in the MR2's that we get are 3SFE, 3SGE & 3SGTE - We do not get the 5SFE Engine therefore i know nothing about it. Lights have a build up of dirt around the edges. Toyota MR2 MK2 SW20. Clear Wing Side Indicators Signal Lights. The engines in the MR2's that we get are 3SFE, 3SGE & 3SGTE - We do not get the 5SFE Engine therefore i know nothing about it. One of the lights has a little green over spray on it. 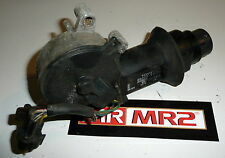 Suitable for: Toyota MR2 mk2 2.0L 2.2L 1989-2000. Note: For earlier MR2 mk2 1989-1993 the center panel between the lights will need to be changed for the later revision 3 curved edge style. These really change the look of any MR2 giving a much more modern look. Black Lexus Style. We give a 1 year warranty on all goods unless otherwise stated - such as ex-demo item which may only have 3 or 6 month warranties. We cannot be held responsible if the product is not suitable for use outside the UK. 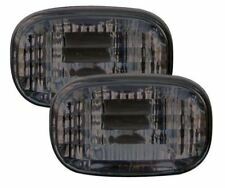 X2 NEW GENUINE TOYOTA PAIR L R SIDE REPEATER CLEAR INDICATORS. Toyota Starlet 1996-1999. Toyota MR2 SW20 1990-1999. Toyota Celica 1994-1999. It is very expensive to own a car in Japan. Japanese vehicles have less miles in comparison to the UK. TOYOTA MR2 MK3 NEW CRYSTAL BLACK WING REPEATERS. New Crystal Black side repeaters. Suitable for: Toyota MR-S and MR2 mk3 1.8L 1999-2007. New Toyota MR2 mk3 Parts. New Toyota MR2 mk1 Parts. New Toyota MR2 mk2 Parts. Toyota MR2 MK2. Item is from a 1993 Revision2 Japanese Import MR2 MK2. Item is for Revision1 &Revision2 Type MR2's only.if unsure pls ask. Drivers Side Rear Light Corner Reflector. The engines in the MR2's that we get are 3SFE, 3SGE & 3SGTE - We do not get the 5SFE Engine therefore i know nothing about it. Toyota MR2 mk1 1.6L AW11 New Pair Glass headlight's. TOYOTA MR2 MK1 NEW RHD HEADLIGHT PAIR. Suitable to fit all Right hand drive (RHD) Toyota MR2 mk1's 1984-1989. New Toyota MR2 mk1 Parts. New Toyota MR2 mk2 Parts. Item is for Revision1 &Revision2 Type MR2's only.if unsure pls ask. Item is from a 1992 Revision2 Japanese Import MR2 MK2. Toyota MR2 MK2SW20. Rev1 Rev2 Type Drivers Side Rear Light Corner Reflector - Right.